The “Italian way”, defined by French wine producers in an article in the Slowine magazine, is that of making wine in terracotta amphorae. The choice made by French oenology to refine wine in terracotta jars, is not a recent one. In fact, for several years now, France with its best-known wine regions, including the Jura, has become an important country for its exports of wine in terracotta. 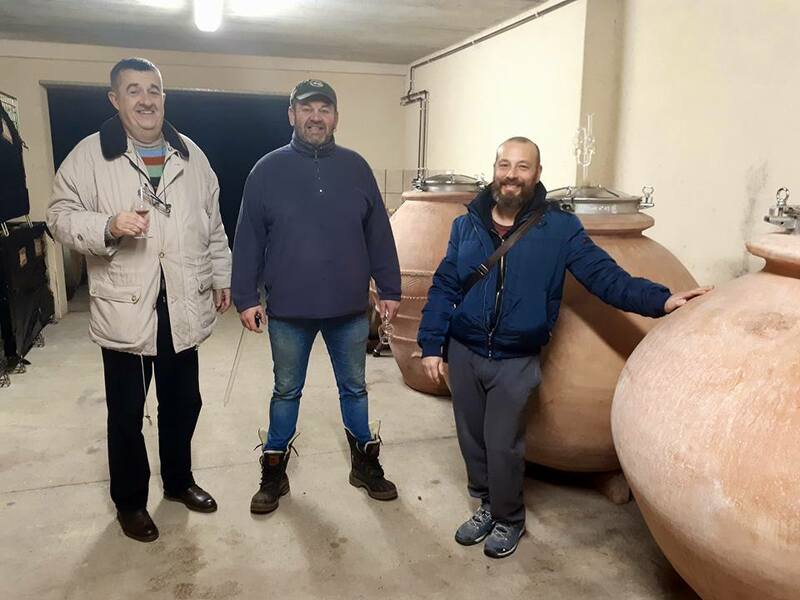 The Gavenat Wine producers, from the Jura, recently visited by the owner of Artenova, Leonardo Parisi (right) pictured together with the owner of Gavenat, (left), has 4 classic jars of different sizes and 3 dolia (replicas of ancient Roman jars). The amphora wine made by Gavenat is called “Rota Gamete”. “After Italy imported the trend of producing non-traditional wines made in French oak barriques…” the author of the article on Slowine asks – Will it follow that we will export terracotta jars of Tuscan production?” Artenova has already embraced this question since Gavenat, together with nearly seventy other wine producers, formed a society for whom he has already produced a large quantity of terracotta wine jars (read here the list of other French companies, customers of Artenova). On a recent trip to Jura – the new Mecca for trendy wine tourism, with my colleagues – I visited some of the most important and renowned wineries of the region. We were overwhelmed by the friendliness of the winemakers and for its amazing wines. We were welcomed, among others by two sacred monsters of the Jura, Gavenat and Bénédicte & Stéphane Tissot. Two companies that are very different from one another, the first can count on a medium-sized area of production (just over a dozen hectares); the second has almost 50 ha. Both protagonists retain a true spirit of craftsmanship and a passion for their work that won us over. In this article I would like to throw a stone into the pond, throw a provocation with reasoning. I will not go into detail about the wines we tasted except that I must honestly say that I found them amazing. Rather, I was amazed still further by a detail that I discovered in both cellars. I’ll start with a brief introduction. When we Italians, Piedmontese in particular, cross the Alpine passes, through the tunnels built by our ancestors, we always do it with a childish awe, mixed with an almost religious respect towards our transalpine cousins ​​who have been able to perform productively and commercially, for now, in a way far superior to us. Let’s leave the very just considerations on the different histories of our countries, on the past, regarding a magnificent chase that has seen Italy now get a step closer to them. All statements 100% shareable. However, the just admiration for their wine-growing regions still remains, for the fame built over the centuries and for the strength of an entire state apparatus that better than Italy, has understood the importance of what wine of the highest quality can give to the economic development of a nation. Well, this is the prologue! The facts are instead the following. In both companies we visited the winemakers told us that they are starting to experiment with the “Italian method”. “What could this Italian method be?” I asked. They showed me some amphorae, all of Tuscan origin. In the case of Tissot there are over 25, while Gavenat for the moment has but a few. In addition they are trying to macerate Chardonnay and Savagnin on the skins. In short, what for the Italians is a Georgian influence, for them it is a system they discovered on visits made to Italy. The same goes for what I found in California, visiting one of our new “snails” of 2018, Matthiasson, a high-quality producer who makes a very intriguing macerated Ribolla Gialla. In short, after years of importing techniques regarding the aging of non-traditional wines in Italy, such as the use of the French oak barrique, will we now export wine jars of Tuscan production? This hypothesis makes me smile, but intrigues me at the same time, because in our small world, new trends (without negative meaning, as far as I’m concerned) are very fast to spread among territories that are very different from one another, extending techniques that are suited to a certain vine but much less to others. I am reminded of the furious haste during the late nineties and early twentieth century in which vineyards in Tuscany and, in a lesser way, in Piedmont were planted with 8,000 / 10,000 vines per hectare, simply because it was what they were doing in Burgundy. From a non specialist point of view, I find myself thinking with curiosity about what will happen in thirty years time when maybe we will go to other countries, of high oenological reputation, and maybe the winemakers, rightly prideful, will show us instead of barriques (a very ugly term that I have always hated) their amphorae (an even more horrible noun). What do you think? Will this happen? Might it happen like with pizza? Will the Americans think they have invented the amphora?